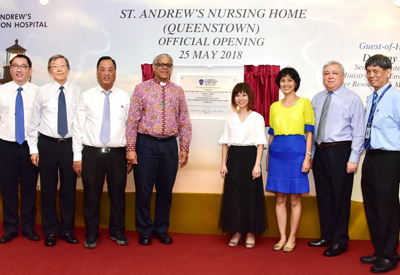 2017 marks the 50th Anniversary of Singapore Anglican Community Services (SACS), sister organisation of St. Andrew’s Mission Hospital (SAMH). It started with a simple step of Faith, sowing Hope among the sick and needy, and bringing the Love of God to the Community. The genesis of Singapore Anglican Community Services (SACS) began in the early 1950s with the establishment of a free clinic by Mrs. Catherine Thomas, a trained nurse and wife of the principal of St. Andrew’s School, Mr. Francis Thomas, to serve the needy villagers living in the Potong Pasir area. God continued to work greater plans through Mr. Francis Thomas. In 1966, he was asked by the Dean of St. Andrew’s Cathedral, the Venerable Tony Dumper to look into the formation of the Anglican Welfare Council, which was later renamed the Singapore Anglican Welfare Council (SAWC). On 31 August 1967, SAWC was inaugurated to minister to and to carry out community services and welfare work amongst the elderly, the poor, the destitute and the aged sick according to the teaching of our Lord Jesus Christ. It was a modest set-up operating from a small building in the compounds of the Armenian Church. Student Counselling Services became the very first service arm of SAWC. Collaborations were initiated with other social service agencies such as the Wilkie Road Children’s Home, drug rehabilitation and the Christian Outreach to the Handicapped. In August 1986, Whampoa Care Centre was set-up. It served as a family crisis refuge for women and children and a day care sheltered workshop which provided skills and job opportunities for persons with mental health issues. Through this service, we realised some of our clients’ fundamental cause of destitution and helplessness was due to their mental health issues. There was a lack of help for people with mental health issues during the time. This motivated us to begin psychiatric rehabilitation and counselling services, which became one of our core services up to this day. SAWC was restructured to bring together the other community service arms of the Diocese, and was renamed to Singapore Anglican Community Services (SACS) in 2004. While there are community service and parish-based initiatives under the umbrella of SACS, we shared a common mission – to seek the welfare of the city and serve the needs of the disadvantaged and the destitute with the love of God. Through the years, God has blessed the works of SACS and expanded our stable of services. Today, SACS is one of the leading and largest Voluntary Welfare Organisations in Singapore, especially in mental health services. 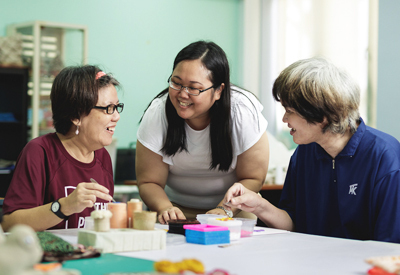 Our Psychiatric Services arm includes Residential and Day Rehabilitation Services at Hougang Care Centre and Simei Care Centre, Community Rehabilitation Support and Services at Bukit Batok, Pasir Ris and Yishun and Integrated Employment Support Services. Together, they provide a seamless continuum of psychiatric rehabilitation services to 2,000 persons with mental health issues annually. Spurred on by our ethos, we made in-roads to Senior Services to meet the prevailing needs of the ageing community in Singapore. 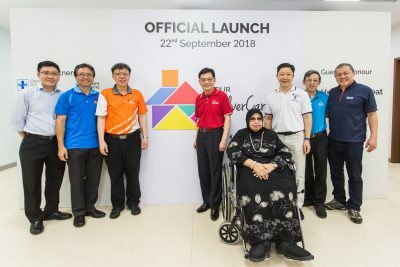 Following the established work of PEACE-Connect Senior Activity Centre at Kampong Glam, it was appointed as a cluster operator in 2015. In the same year, SACS Cluster Support and Senior Group Home at Jurong East were opened to enable needy seniors to age-in-place within the community. SACS Senior Centres at Floral Spring, Golden Orchid and HillV2 were new initiatives rolled out in 2016 to reach out and engage the seniors actively through various programmes at the centres. Our Family and Children Services continue our mission in reaching out to the groups-at-risk. SACS Family Care Centre has provided temporary safe refuge and support to more than 3,000 women and children of domestic violence since 1986. CITY Community Services seeks to meet the needs of underprivileged primary school children through Befrienders Clubs in 16 schools. As we enter into the year of Golden Jubilee, a new service milestone awaits. The works of SACS Psychiatric Services had received affirmation from the Ministry of Health. In 2016, it has appointed SACS to operate a Sheltered Home for Person in Mental Health Recovery. A first-of-its-kind in Singapore, this Home is part of our continuum of care for persons with mental health issues. The Home, when ready in 2017, will offer temporary accommodation to 60 adults and 20 youths recovering from mental health issues and help them reintegrate into the community. God has guided SACS in the past 50 years and is shining brightly on us. The future of SACS is not only about continuing the heritage of serving the needs of the community, but most importantly, doing it in God’s way and serving with a heart that exemplifies His great love. As we embark on a new journey for the next 50 years and beyond, let us continue to work hand-in-hand, shining God’s light through our works. SACS serves with love, because we have been first loved by God.